Emerging evidence supports that the entity known as idiopathic nodular glomerulosclerosis is not idiopathic. A strong causative association with longstanding cigarette smoking and hypertension has been identified. Morphologically, smoking-associated nodular glomerulosclerosis closely resembles diabetic nephropathy. The potential roles of advanced glycation end products, oxidative stress, angiogenesis, and hemodynamic perturbations are explored. Admitted to the hospital was a 70-yr-old white woman with cellulitis of the right foot. She had a history of longstanding hypertension and bilateral severe peripheral artery disease with a chronic nonhealing right foot ulcer. She did not have diabetes but had severe chronic obstructive pulmonary disease (COPD) and a history of heavy cigarette smoking (2 packs per day for 30 yr), which was discontinued 20 yr ago. She was found to have acute on chronic renal insufficiency with an increase in serum creatinine from baseline of 1.9 mg/dl 5 mo before to 3.2 mg/dl on admission in the setting of recent diarrhea and ibuprofen use. Physical examination revealed a BP of 153/60 mmHg and no peripheral edema. Medications included metoprolol, furosemide, amlodipine besylate, and home oxygen (4 L/min). Pertinent laboratory results included white blood count 17,700/mm3 (normal range 4000 to 11,000/mm3), glucose 62 mg/dl (normal range 70 to 110 mg/dl), serum albumin 3.2 g/dl (normal range 3.5 to 4.9 g/dl), and serum cholesterol 113 mg/dl (normal range 130 to 200 mg/dl). The 24-h urine protein was 2.1 g. All serologies were negative, and no M spike was detected on serum protein electrophoresis. Urinalysis showed 3+ protein and inactive sediment. Kidney size was normal by ultrasound. On renal biopsy, nine of 32 glomeruli were globally sclerotic. Glomeruli were hypertrophied with diffuse and global, moderate to marked mesangial sclerosis forming large nodules that narrowed the capillary lumina. Some nodules were densely sclerotic and stained periodic acid Schiff positive, argyrophilic and trichrome blue, consistent with matrix material (Figure 1A). Other nodules appeared more cellular owing to internal neovascularization by small endothelial-lined channels (Figure 1B) that were highlighted with CD34 immunostain (data not shown). There was diffuse thickening of glomerular basement membranes (GBM), some of which appeared duplicated. Moderate tubular atrophy and interstitial fibrosis occupied approximately 30 to 40% of the cortex. There was thickening of the tubular basement membranes (TBM) of both atrophic and nonatrophic tubules. Proximal tubular cells displayed focal epithelial simplification, suggesting acute ischemic tubular injury. There was moderately severe arteriosclerosis and arteriolar hyalinosis. Congo red stain for amyloid was negative. Renal biopsy findings. (A) A representative glomerulus contains large acellular periodic acid-Schiff (PAS)-positive nodules composed of lamellated matrix material. (B) In some glomeruli, the mesangial nodules appeared more cellular as a result of the presence of numerous minute endothelial-lined channels. (C) By electron microscopy, the nodules are composed of dense matrix material with reduction in capillary luminal diameter. There is also regular thickening of the glomerular basement membranes, without evidence of electron-dense deposits. Foot processes appear focally effaced. Magnifications: ×400 in A and B; ×2000 in C.
Immunofluorescence showed 1+ linear staining for IgG and albumin involving GBM and TBM. Staining for IgA, IgM, C3, C1q, fibrin, and κ and λ was negative. On ultrastructural examination, the mesangial areas were segmentally expanded by marked increase in mesangial matrix (Figure 1C). GBM were moderately and diffusely thickened by matrix material. No immune-type electron-dense deposits were seen. There was moderate (50%) effacement of foot processes. Nodular glomerulosclerosis denotes a histologic pattern of nodular mesangial sclerosis with accentuated glomerular lobularity. Differential diagnosis includes the entities listed in Table 1.1–3 In our case, the absence of immune deposits by immunofluorescence excluded chronic membranoproliferative glomerulosclerosis–and dysproteinemia-related glomerulopathies. By electron microscopy, no organized deposits were seen. Although the mesangial sclerosis and GBM and TBM thickening were typical of diabetic glomerulosclerosis, the patient had no history of diabetes. In the past, the occurrence of diabetic-like nephropathy in a patient without diabetes was termed “idiopathic nodular mesangial sclerosis” or “idiopathic nodular glomerulosclerosis” (ING).4,5 This previously enigmatic condition recently has been linked to cigarette smoking and chronic hypertension, supporting its emergence as a distinct clinicopathologic entity.6 In the case reported here, the history of longstanding hypertension, smoking, COPD, and severe peripheral vascular disease strongly favored smoking-associated nodular glomerulosclerosis. Fewer than 50 cases of ING have been published in the English literature (reviewed by Kuppachi et al.7). Our group reported the largest series of ING (23 patients) and was the first to identify a causative association with smoking.6 ING composed 0.45% of native kidney biopsies that were accessioned over a 5-yr period (1996 to 2001) at Columbia University. The 23 patients were predominantly elderly (mean age 68.2 yr), white (73.9%), and male (78.3%). There was a high prevalence of longstanding hypertension (95.7%; mean duration 15.1 yr) and heavy smoking (91.3%; mean cumulative intake 52.9 pack-years). Among smokers, 57% were actively smoking and 43% were reformed smokers, underscoring the importance of careful history taking. Hypercholesterolemia (90%) and atherosclerotic peripheral vascular disease (43.5%) were common. The majority of patients presented with renal failure (82.6%; mean serum creatinine 2.4 mg/dl) and proteinuria (>3 g/d in 69.6%; mean 24-h urine protein 4.7 g). Nephrotic syndrome was present in 21.7% of patients. All renal biopsies disclosed diffuse and nodular mesangial sclerosis, thickening of GBM, arteriosclerosis, and arteriolosclerosis. Some had additional features of diabetic nephropathy, such as Bowman's capsular hyalinosis, glomerular microaneurysms, TBM thickening, and afferent and efferent arteriolar hyalinosis. Since the time of our publication, we also have observed examples with diffuse mesangial sclerosis lacking nodules. Median time from biopsy to ESRD was only 26 mo. Pathologic predictors of progression to ESRD included severity of interstitial fibrosis/tubular atrophy and arteriosclerosis. Continuation of smoking and lack of angiotensin II blockade had a negative impact on renal survival. 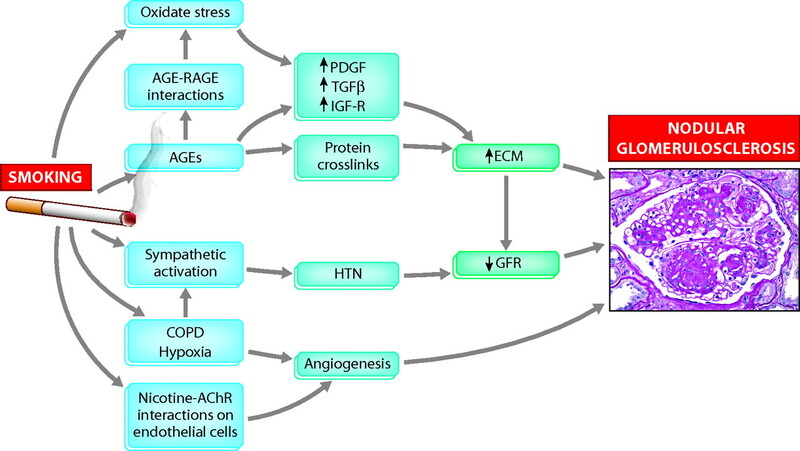 Flow chart illustrating the hypothetical pathophysiologic mechanisms in smoking-associated nodular glomerulosclerosis. Smoking exerts effects on intrarenal hemodynamics, mainly through sympathetic activation, which induces renal vasoconstriction and consequent reductions in renal blood flow and GFR.26 Odoni et al.27 studied the effects of cigarette smoking on renal injury in rats with subtotal nephrectomy. Exposure to cigarette smoke condensate increased glomerulosclerosis and interstitial fibrosis in rats that underwent subtotal nephrectomy but not sham-operated rats. Importantly, this increase could be prevented by renal denervation. They concluded that the smoking-induced renal damage occurred preferentially in the setting of a preexisting sclerotic insult and was mediated primarily by sympathetic activation.27 In ING, the major preexisting sclerotic insult is likely to be hypertensive nephrosclerosis. Chronic hypoxia as a result of COPD also may activate the sympathetic nervous system, which in turn stimulates the renin-angiotensin system, suggesting a potential amplification mechanism promoting ECM production and hypertension. Most patients with ING are elderly and give a history of longstanding hypertension, in addition to smoking. Of note, ING occasionally has been reported in hypertensive patients without documented history of smoking.6 Conversely, smoking is a major risk factor for hypertension. These complex interrelationships support that hypertension may be an independent risk factor for ING, as well as a major co-factor. A potential link between these processes is AGE, which have been implicated in the development of aging, vascular stiffness, atherosclerosis, and hypertension.28 Because arteriosclerosis and mild mesangial sclerosis are also features of hypertensive renal injury, it is tempting to speculate that ING represents a special form of hypertensive arterionephrosclerosis that is modified by smoking. In short, “idiopathic nodular glomerulosclerosis” is becoming an obsolete term. Patients with a strong link to cigarette smoking and hypertension are emerging as a distinct clinicopathologic group. In the appropriate clinical setting, we propose that the designation ING should be supplanted by “smoking-associated nodular glomerulosclerosis.” Greater study is needed to unravel the complex and potentially synergistic interplay of AGE formation, oxidative stress, angiogenesis, and altered renal hemodynamics. Smoking: A Risk Factor for Progression of Chronic Kidney Disease and for Cardiovascular Morbidity and Mortality in Renal Patients Absence of Evidence or Evidence of Absence?